Mesmerize the crowd in this gorgeous Sherri Hill prom dress 52501. This glamorous ensemble showcases a high halter neckline for modesty and an a line silhouette. The a line skirt is embellished with dainty pearls that add a classy and chic look. 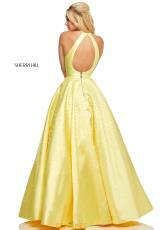 The back of this gown features a back zipper closure. For more styles by Sherri Hill visit Peaches Boutique in Chicago.